Nikos, Myrta and their children have been the soul of the family farm since 1996 and they are devoted to the organic cultivation of olive trees throughout the year producing EIRINI PLOMARIOU, an award winning organic olive oil. It is the olive oil they proudly use in their agrotourism unit in Plomari, and which has won fervent admirers throughout the world for its aroma and quality. Lesbos, Greece - Odysseas Elytis, the Greek Nobel laureate and poet, once wrote: "If you disintegrate Greece, in the end you'll see that what you have left is an olive tree, a vineyard, and a ship. Which means: with these you can rebuild it." Having endured eight years of a deepening economic crisis, thousands of young Greeks are taking heed of Elytis' words by leaving the cities to work on the land. One of them is 35-year-old Alexandros Kleitsas­, who until four years ago had spent his entire life in Athens, the capital of Greece, working for a private company that certified organic products. After spending two years being unemployed, Alexandros decided he had no other option but to leave everything behind and move to his grandparents' village in Kalabaka, four hours' drive north of Athens. There he started a farm with his brother and three friends. "Someone has to start producing again in this country," Alexandros says. "We can't all be in the service sector and so I left the city. I started from zero, without any land or experience." Alexandros isn't alone in his thinking. For the first time in 20 years, employment in the agricultural sector has been rising, from 11 percent in 2008, a 35-year low, to 12.9 percent in 2015, according to the latest available report by the Greek Statistical Service. Almost half of all new farmers come from the cities. Unemployment is a major factor in the rise in people working on the land. The unemployment rate for people under the age of 25 is 48 percent and sits at 30 for those aged between 25 and 34. With many university-educated Greeks unable to find jobs in the public or private sector, thousands of 20- and 30-somethings like Alexandros are turning to agriculture. According to figures provided by the Association of Young Farmers, there has been a 15 percent increase in farmers between the ages of 18 and 40 since the start of the economic crisis in 2009. Despite the country's mild climate and fertile land, for decades most Greeks opted for better-paying, comfortable, jobs in the city. EU and government agricultural policies that hurt mostly small farm owners, the majority of Greek farmers, resulted in the speeding up of urbanisation with half of the country's population living in the two biggest cities, Athens and Thessaloniki. Land was either left uncultivated or tended to by poorly-paid migrant labourers. Today, Alexandros cultivates organic olive oil and St. John's wort, a herb with anti-inflammatory and antidepressant properties. He combines the two to produce a variety of skincare products called Dimitra which are sold throughout Greece and also exported to Germany, Belgium, Florida, and Bahrain. Greek farmers face obstacles like any other business owner or entrepreneur in the country. Constantly changing tax laws and the lack of available bank loans, especially for farmers, are some of the main challenges. Due to the economic crisis, banks have mostly stopped lending money, even to healthy businesses, while the government sold the formerly public Agricultural Bank of Greece to a private bank in order to raise money and repay its creditors. Since the start of the crisis, the number of first-time farmers applying for EU subsidies has doubled. On April 25, the Ministry of Rural Development and Food reported that more than 15,000 people applied this year for the 12,000 EU subsidies available for first-time farmers in Greece, an increase from the 11,400 applicants in 2014 and the 8,600 in 2009. "The [EU] subsidies are helpful," said Yannis Tsironis, the alternate minister of rural development at a press conference in late April. "Agriculture and farming are Greece's future. There are regions in the country that are solely based on the primary sector." Even so, the government this year raised farmers' income tax from 13 to 22 percent, and to 45 percent on those whose annual income exceeds $43,600 (40,000 euros). "We need small funds so we can invest, either from EU subsidies or from an agricultural bank," says 35-year-old Thodoris Vasilopoulos, the president of the Association of Young Farmers and a third generation farmer. "But most young farmers don't have access to EU and Greek subsidies because of an anachronistic Greek law from the 1990s," he adds, explaining that because of this law, farmers who were active in that decade still receive funding while younger people cannot access them. Many of the subsidy recipients are now in their 80s, he says. Greek bureaucracy is also a hurdle. "We farmers have to be out in the fields," Thodoris says. "Things that can be done electronically should be done online and not have someone at the tax office tell you 'I'm swamped, come tomorrow'. We're not beggars. We don't want money or political favours. We just want things to run smoothly." Thodoris and other young Greek farmers have turned to organic farming as well as processing, bottling, and exporting their products themselves. For years, Greek farmers didn't brand or bottle their olive oil. Instead, they'd sell it to Italy and Spain in bulk. There, it was bottled and sold as Italian or Spanish olive oil around the world. With the crisis, many Greek farmers decided to stop selling their olive oil in bulk and to instead bottle their own product, create a brand and market it around the world on their own. "A surplus value is added to our agricultural products when we process and bottle them, so we can make a bigger profit," Thodoris explains. "This keeps us alive." In the meantime, a movement called "Without Middlemen" has sprung up. Since 2012, on sporadic Sundays, producers across Greece bring their products to the cities and sell them directly to consumers, maximising their profits and lowering costs for buyers who have been hit by the crisis. Many farmers have also created websites to sell their products online. Thodoris sells his on his website and at small stores which promote local products and take less of his profit margin than big supermarkets. Some have turned to new products like so-called "superfoods," such as certain nuts, berries, and whole grains. 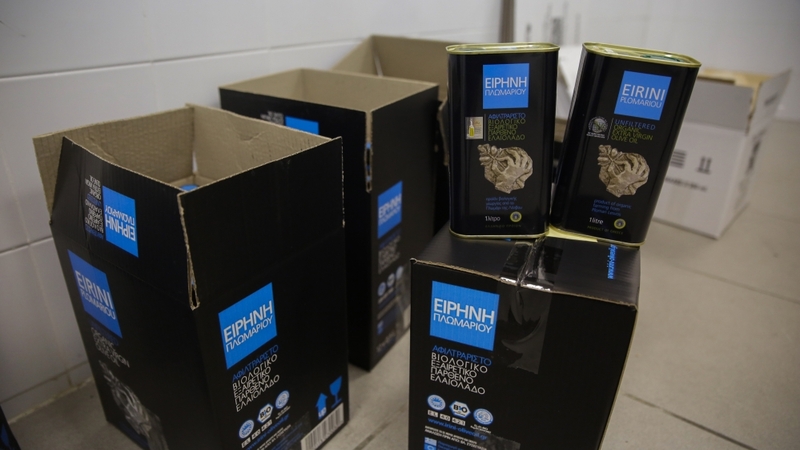 "Both in Greece and abroad, quality wins over price," Thodoris says. Distribution has also changed. "Door-to-door and skipping the merchant are also ways for us to increase our profit," he says. "Everything changes from below, from the people. We go to exhibitions together to showcase our products. We advise each other." For many young Greeks who have the option, returning to their family farms once they've completed their studies, has become their most viable chance for employment. "Growing up, I always thought that farming would be an extra income like it has been for my parents," says Maria Kalaboka, 27, who this month earns her master’s degree in law in Thessaloniki. "But seeing the unemployment that exists in the city, I decided to make our family business my full-time job. If you're unemployed in the city, you don't have any options," Maria says. She moved home this month to start working full-time on her family's olive grove. Speaking in her family's olive mill near the village of Plomari in Lesbos, Maria paints a bleak picture of how life in Thessaloniki means homelessness, unemployment, and depression: "Here, you won't go hungry. At least you'll be able to grow your own food." The Kalabokas produce extra virgin organic olive oil, which they bottle and in 2012 started exporting to countries such as Germany, Denmark, Norway, and Japan. Eirini Olive Oil, named after Maria's grandmother, often sells out a few months after bottling. The family says they produce more than 12 tonnes of olive oil per year. Maria is poised to take over the running of the family business. Her 18-year-old sister Irini, a senior in high school, hopes to study chemistry or agriculture to later support their work. The family's choice of product seems a natural one on an island which, with more than 11 million olive trees, is the third-most important olive oil-producing region in Greece. After Spain and Italy, Greece is the third-largest producer of olive oil in the world. 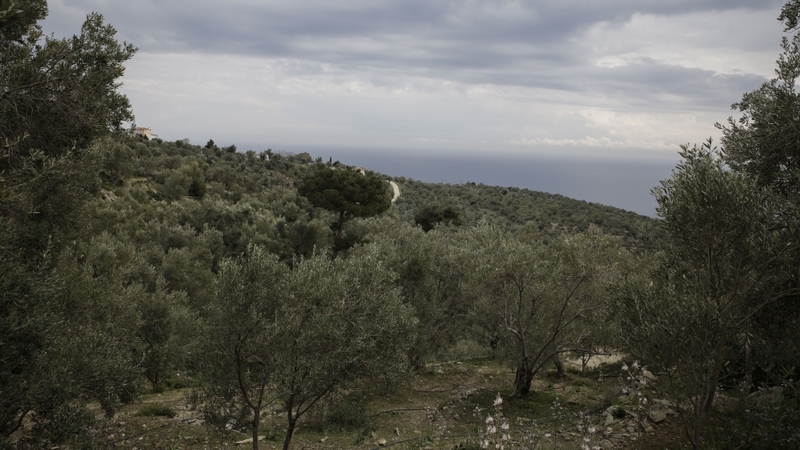 The family cultivates 20,000 olive trees - some theirs, others they rent - on the Aegean Sea. The horses they keep in the grove are the best weed cutters and provide manure to fertilise the trees, explains Maria's mother Myrta. There's no stigma around farming, the sisters explain, although Irini says it can sometimes prevent them from going out with their friends on a Saturday night. "But most of our friends' families have a few olive trees themselves, just enough for the family's olive oil, so they know how it is," she adds. Plomari, with a population of 3,000, is also known for its ouzo distillation. In the 19th century, it became an important trading centre because of its tanneries and soap and proximity to the Turkish shore. "In summer, it's really crowded here," Maria says. "There are tourists visiting us. We take them to the olive grove, we show them the mill, then cook for them and they do some olive oil tasting. We explain to them how our olive oil is like medicine. They're always impressed by how young we are." Her parents, both teachers at local schools, slowly set the foundations for the family business. Before the crisis, turning olive oil production into their main source of income wasn't on their minds. But after their public sector salaries were cut and their taxes increased, they saw how hard it would be for their children to find jobs, and decided it would be prudent to focus on their business. All four Kalaboka children have grown up working in the grove - many Greeks have family farms where children help during the harvest - but Maria says that until recently, she never thought it would be her career. "We're working here in order to have a job for all of us, especially due to the crisis in Greece," she says. "It's a difficult job," Maria says. "But I really enjoy it. What the ancient Greeks called 'ef zin' - a good quality of life - I have it here, in this beautiful environment, through this job, which I already know well, so why should I not want it? It makes me happy. I'm always happy here and that's the most important thing. I can't imagine myself locked in four walls, doing the same thing every day." Her parents say they never pressured their children to work in the family business. "We told them to study whatever would make them happy and afterwards feel free to do whatever job they wanted," Nikos, the father, says. Since the crisis started, Greece's GDP has shrunk by 25 percent, while household spending is down by 40 percent. For years, EU funds were mismanaged and in some regions of the country, instead of being invested in the primary sector, they were turned into expensive cars and luxury houses. Speaking last December to a crowd of farmers in Crete, Prime Minister Alexis Tsipras said: "It's the country's ethical and political obligation to support farmers. Because we have a vision, to boost the country's economy, not only depend on tourism. A country can't depend only on tourism, especially one like Greece that has the ability to produce such great quality products." Today, the agricultural sector's contribution to the economy has risen by one billion euros from 3.1 percent in 2008 and the beginning of the crisis, to 4.2 percent. Agriculture's contribution to the Greek economy is twice that of any other country in the EU, according to the Agricultural University of Athens. "We, the young people in the primary sector, have the key to recovering from this economic crisis," Thodoris says. "We can do it, as long as we work together, and work hard."